Trekking in Ganesh Himal is known as non-tourist trekking area of Nepal in comparison to Annapurna, Langtang and Everest region. We are trying to promote this region to make a popular destination for trekking. We want you to like in nature where most of the things are still natural. 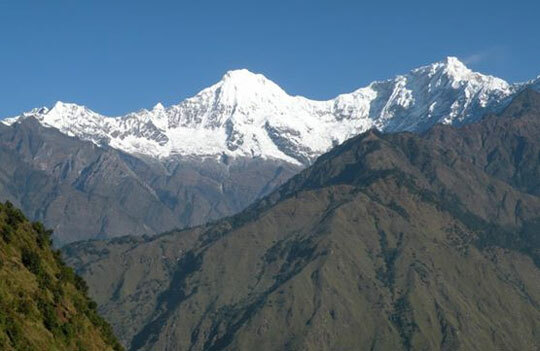 Ganesh Himal Trek lies on the central eastern region of Nepal. This region also offers spectacular views, untouched natural vegetation, splendor wildlife, and friendly inhabitants. The Ganesh Himal is named after elephant-headed God of Good Fortune. We can see a spectacular view of Ganesh Himal from Kathmandu Valley. The Ganesh Range Peaks (Ganesh I, Ganesh II, Ganesh III, Ganesh IV) stands out like crystal. It is like "Great Himalayan Chain" forming the skyline. This great Himalayan massif contained between the valley of the Budhi Gandaki in the west and Bhote Koshi in the east. Finally, becomes Trishuli Khola in the lower section. The terraced hillsides seem to climb to the clear sky. Many inhabitants, ethnic groups with a mixed lifestyle can offer you a glimpse into real Nepal. As you can see Nepalese customs, cultures with different traditions and their real life. It makes heart touching to any trekkers as well as nature lovers. The height of Sing-La 4075 m is just one of the high points of this trek as you can see the magnificent view of the mountains and valley. Moreover, it is a classic camping adventure of a lifetime. On our 14 days Ganesh Himal Trek, we observe the different ways of life, culture and come in contact with the rural people in the small village, passing through the dense forestation and meadows. We cross through high Shing La Pass 4075 m which conversely offers an excellent view of the massif Ganesh Himal, Langtang, and Annapurna. On the last day of our trip, we take a bus ride back to Kathmandu or Pokhara or Chitwan from Dhading Bensi. Finally, spend overnight in a local lodge. Day 04: Trek to Kispang (1900m), overnight at tented camp. Day 05: Trek to Gonga (2600m), overnight at tented camp. Day 06: Gonga to Rupchet (3720m), overnight at tented camp. Day 07: Acclimatization day, hiking around to explore the beauty of that area, overnight at tented camp. Day 08: Rupchet to Kharka, crossing the Singla Bhanjyang (4075m) and camp at Kharka (3545m), overnight at tented camp. Day 09: Trek to Borang (1715 M), overnight at tented camp. Day 10: Trek to Jharlang Phedi (1305 m), overnight at tented camp. Day 14: Final departure to Kathmandu airport or further program according to your flight schedule.